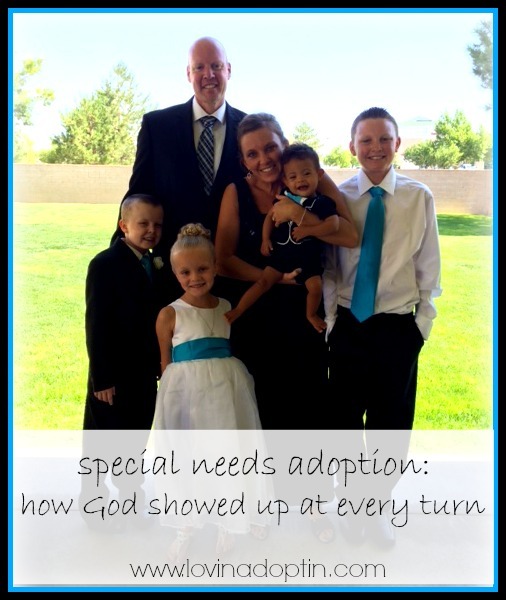 For National Adoption Month, I asked my friend, Christy, to write their story for Lovin’ Adoptin’. Enjoy! On July 17, 2013, I received a text from my sister that would completely alter what our family looked like. She texted to let me know a friend of hers was working with an adoption agency that was trying to a place an almost one-year-old boy who had Down Syndrome. My heart skipped a beat and my mind started racing. From the time I was a teenage girl, God had given me a special love for people and kids with special needs, specifically Down Syndrome. While in high school, I surrendered my life to full-time service for God however He chose to use me. 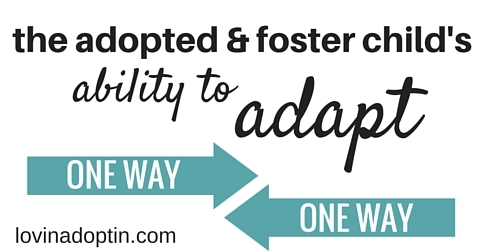 One calling on my life was to adopt a child with Down Syndrome. It was different than just wanting too. I began telling people as a high school student that one day I was going to be a mother to a child with Down Syndrome. People would nod as if to say, “That’s neat”, but not truly believing it would come to fruition. God gave me this desire. He provided it deep in my being. Psalm 37:4 says, “Delight yourself in the Lord and He will give you the desires of your heart.” The Lord was the provider of the desire. God provides. I made a phone call to the agency and explained why I was calling. The agency director answered the phone and told me about a baby boy with Down Syndrome who was almost one. They were trying to find a family to commit to adopt him to keep him from being moved to an institution. “Institution?” I asked. “Where is this baby?” She answered, “Ethiopia.” Minor detail that I failed to think through before I called. International adoption had never been on my radar. She asked if we had a home study already. Another minor detail…we hadn’t completed (or even started for that matter) a home study. Oh and one more thing…we didn’t have any money either. Kindly, the agency director basically told me there was no possible way to get everything done for us quick enough to keep this boy from going to the institution. I hung up the phone and started preparing to present my case to my husband, Matt, when he came home for lunch. Matt came home from lunch and he was not expecting what I laid out on the table! I told him about my phone call and about this little boy sleeping on the other side of the world. Of course, he immediately had questions of how, when, where, how much? We prayed and he said, “Make some phone calls and we’ll talk about it more later.” I called the agency and told them we’d like to pray about it through the weekend and we’d call them back on Monday. I didn’t want to pressure Matt into making a decision. I would say “Yes” in a heartbeat to this little boy, but I wanted him to lead in this decision. I began again surrendering this to God and asking that God would lead my husband in the way we should go. God provided Matt with an answer. With tears in his eyes, Matt tells me on Saturday morning that through the night he couldn’t sleep and began praying. Then he said, “God told me that Endale is our son.” God provides. That weekend, I also got a phone call from a lady who I’d found locally to do a home study. She tells me that she needs to get the home study done quickly because she is also a teacher and school was about to begin. Our home study was complete in a little more than two-weeks. God provides. Now was the question of where we were going to come up with $34,000. We had saved up $500 in a drawer hoping to eventually take our kids to Disneyland someday. When it came time to pay for our home study, the lady said she needed half the payment to begin. The total was $1000, so we handed over our $500 having no idea where the rest would come from. Five months into the process, we were fully funded for the adoption through grants, fundraisers and penny pinching in every way possible. God provides. Fast forward to our time to travel to meet our sweet boy face to face. I have in the past struggled with a fear of flying. For the most part, I felt like I had overcome it, but a twelve-hour flight from the USA to Africa was daunting. I was on my hands and knees begging God to give me His overwhelming peace about flying when I found out that Matt would be staying in Ethiopia and I would be traveling back alone. Perfect peace as only He can give on all my flights. Again, God provides. I could give you story after story about the way God worked out the timing while Matt was in Ethiopia with Endale. I personally know another mother from our agency that has been in Ethiopia for five-months waiting to come home. 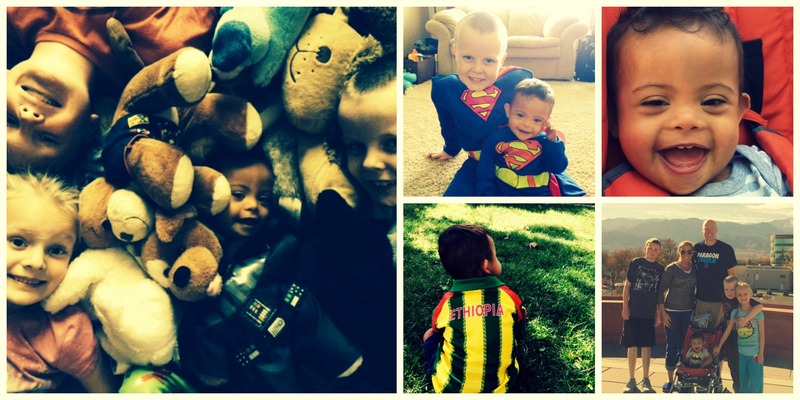 Matt came home from Ethiopia two-weeks after our court date. God provides. Then, God provided plane tickets through long-time friends so that I could meet and join Endale and Matt as soon as they were back in the US. God provides. 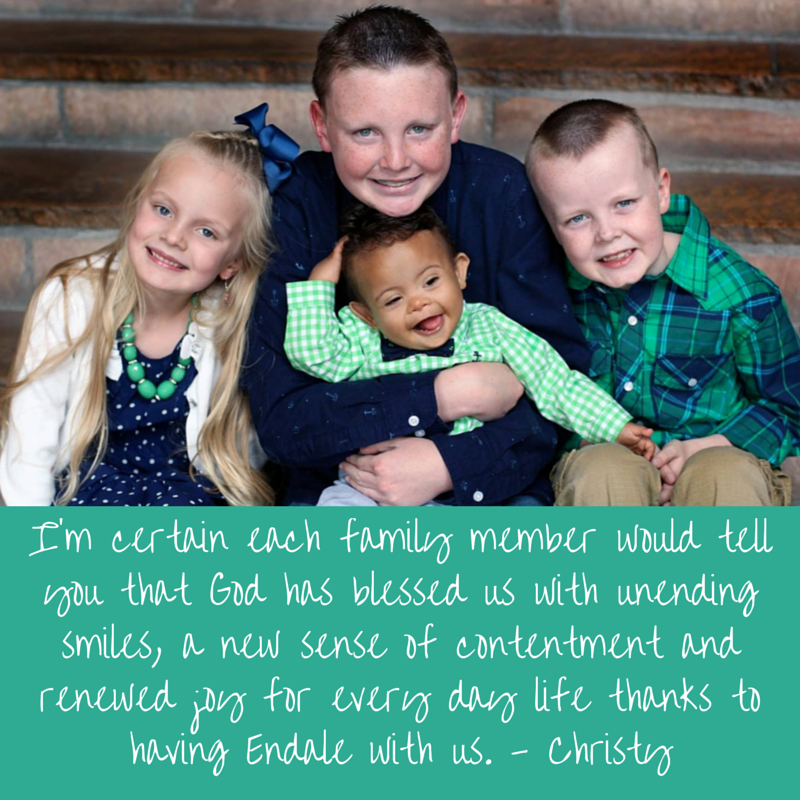 It’s easy to see Endale’s viewpoint, God has provided for him a family forever to love him unconditionally. I’m certain each family member in our house would tell you that God has blessed us with unending smiles, a new sense of contentment and renewed joy for everyday life thanks to having Endale in our lives. God provides. I don’t know what our future will look like after the adoption of our child with Down Syndrome. I know for now it means a lot of doctor’s appointments, therapy several times a week, patience in teaching concepts and learning new things about Down Syndrome every day. I know it means we may have to sacrifice things in the future. I can testify that God has been faithful to our family, Endale included, over and over again. He will provide the tools and insight to nurture our family and our son. He will give us the strength to give our son the best possible care we can for him. He will fill us when we’re empty. He will meet our needs. God provides. 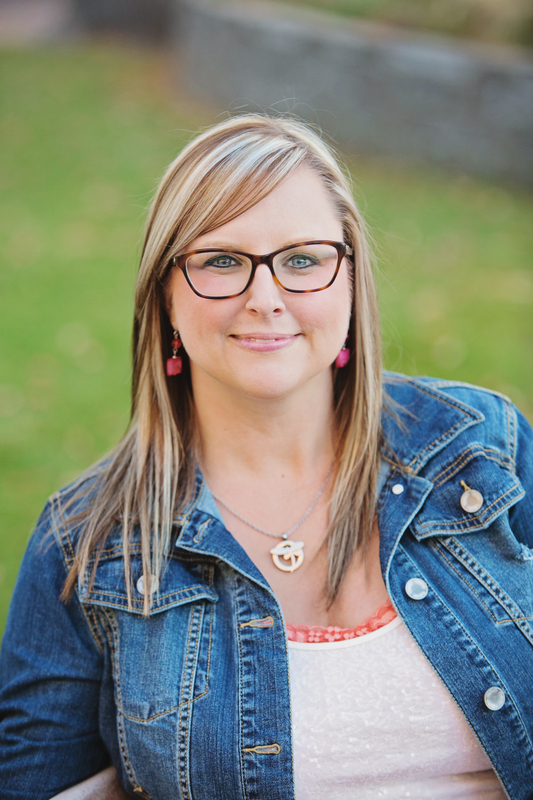 Many thanks to Christy and her family for sharing their story! 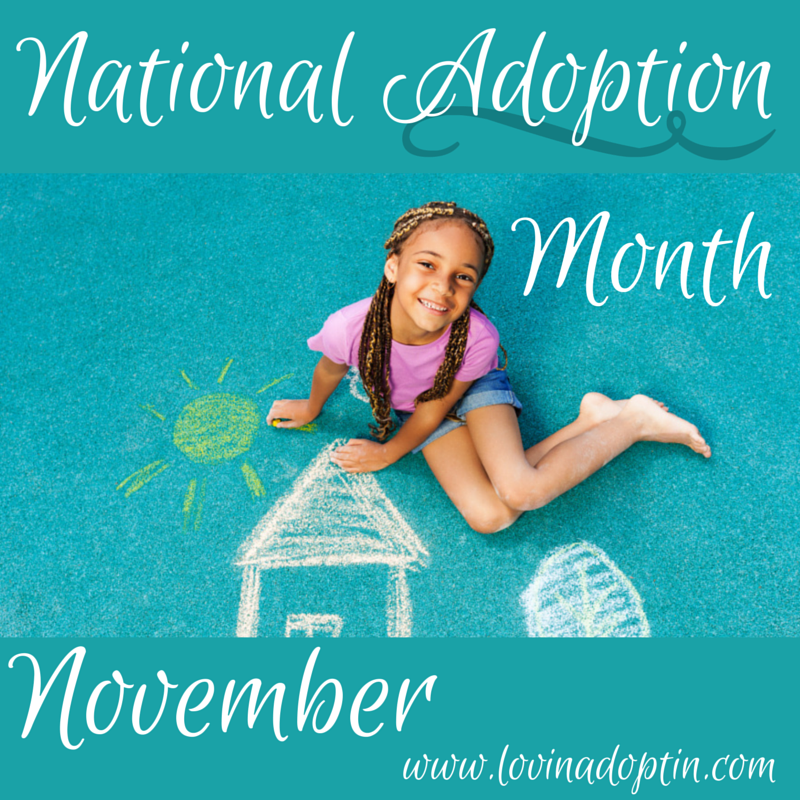 May you all find something to celebrate during National Adoption Month. I don’t suggest reading this if you don’t want your family to change. 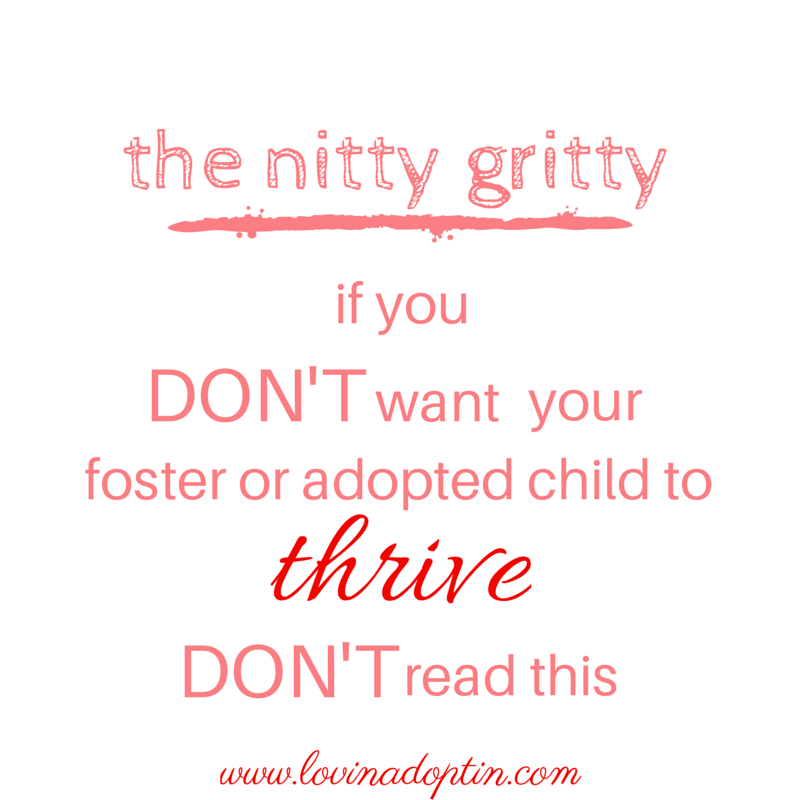 This will ruffle feathers, they’ll go flying, but this is so important if you want your family to do well, if you want your child to heal and your family thrive. I’ve avoided writing this because I don’t want people to get mad and run, but if I don’t write it, families may falter, and that’s not my desire. 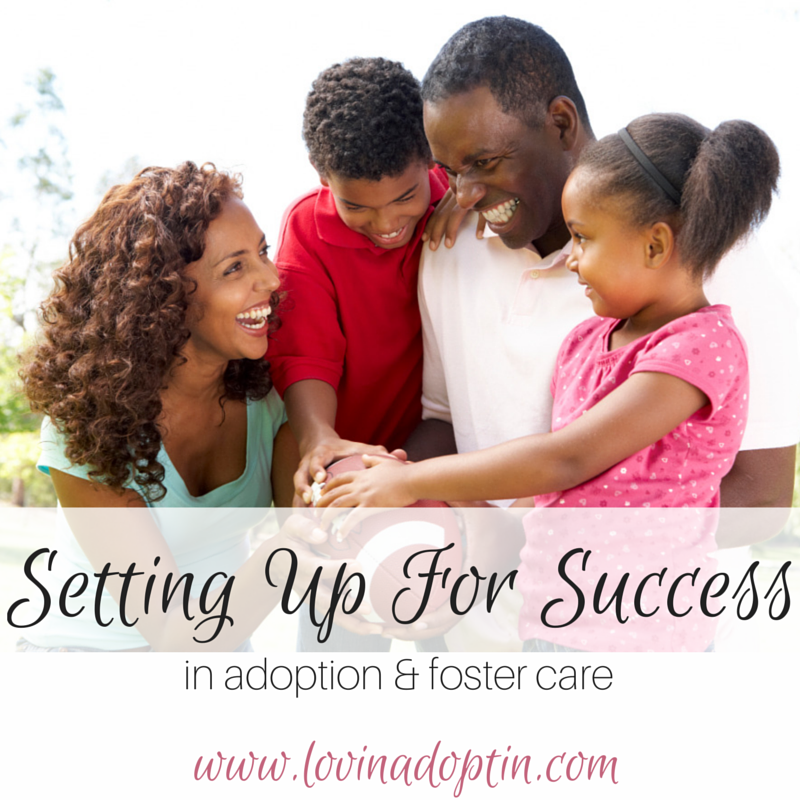 All of the time I spend on Lovin’ Adoptin’ and speaking is with a goal to help families. 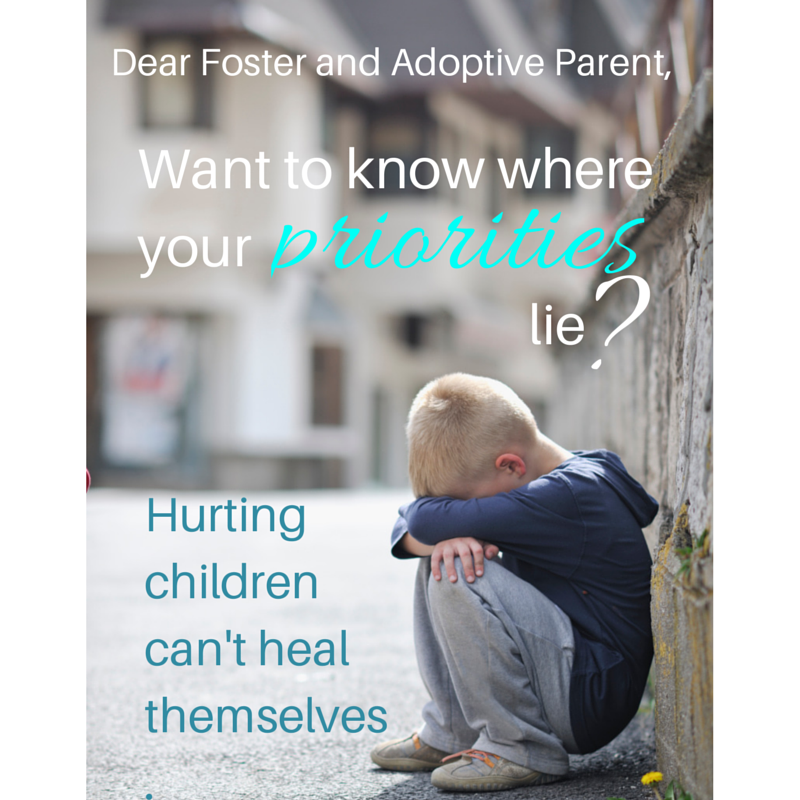 I’ve tackled dozens of other topics on adoption and foster care, on how to help traumatized children do well, but this one topic I’ve avoided because it’s not popular, and frankly, I don’t think families want to hear it. specifically the needs of your traumatized child. 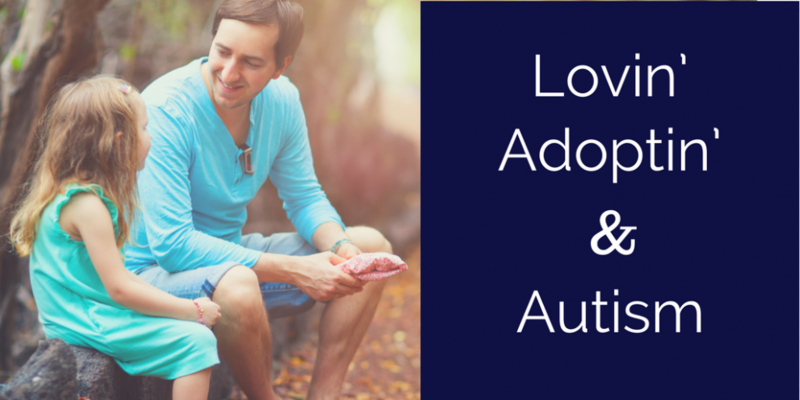 I know there are many parents out there who feel they aren’t taking care of themselves, and the focus in adoption groups and adoption and foster care related articles is to take time for yourself. While it’s important to take time for yourself, there needs to be balance. I’ve written about that, however, today my focus is on both parents. One family sticks out in my mind when I think of this topic. This family, I’ll call them Sweney, ranted about how their daughter, Adia, who they adopted from another country (where she was deeply traumatized multiple times), wasn’t bonding with them. They couldn’t understand it, they felt like they’d done all they could to meet her needs, yet she was unhappy. Problem number one, they blamed her. I’ll talk about blaming more in depth another time, but this family placed all responsibility on this girls shoulders, they expected far too much of her and didn’t go the distance on their end. How is it that they didn’t go the distance on their end? Her actions, none of them violent or defiling by the way, were screaming that she wanted attention and time. The little attention and time they gave her wasn’t rewarded, so they did less. They wondered why she wasn’t happy, wasn’t obedient, wasn’t appreciative. What was her problem? It wasn’t her problem, it’s not something she needed to fix. We shouldn’t say, she isn’t bonding. Does she really have a mental choice? I don’t think so. Sure older children can make the choice at some point, sometimes, to be kind to their adoptive or foster parents, however, can they make the choice to bond? 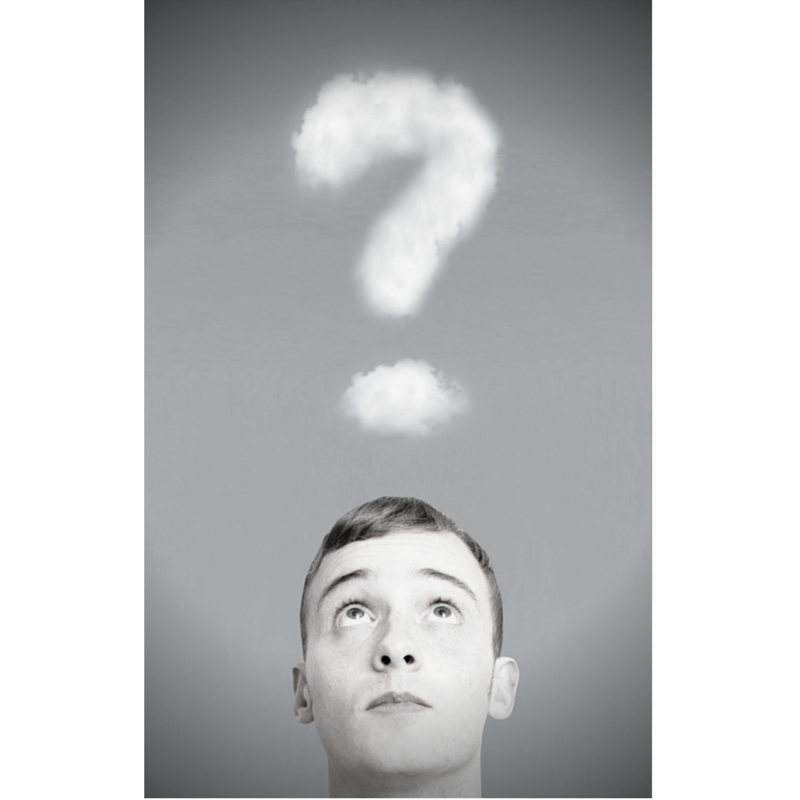 Ponder this question for a bit if you will. First, for young Adia, not nearly enough time was given for her to overcome her grief and pain. Second, what was the family doing to help her heal? Were they giving her opportunities in America? Yes. Were they providing a nice room, toys, clothes, and good food? Yes. But, is that enough? You can read more about the question that circles adoption and foster communities about love being enough here. While you can follow all the advice I’ve written here on this website, if you don’t have a key piece, you’ll have a really hard time bonding with your child. 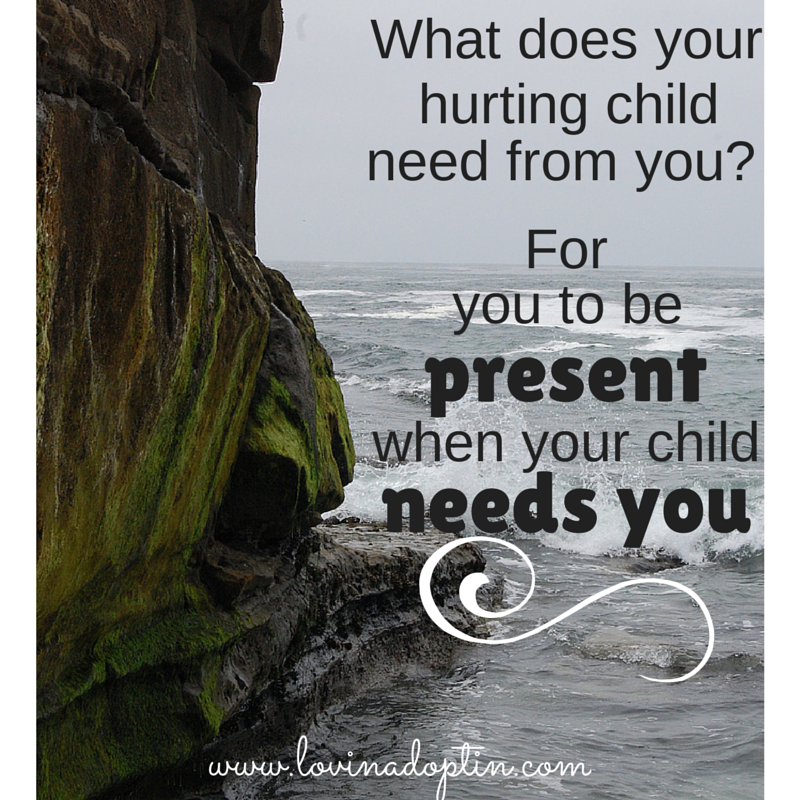 That key piece is being a unit, one that’s dedicated to your child who’s been neglected, abused, disappointed, abandoned. That’s what this family was missing. Here’s what their family was like. Dad golfed any chance he got; weekends, holidays, afternoons. When football, hokey, soccer, or leaf picking was on, he was watching. When he was asked to watch the children, he sat in his recliner watching…you guessed it, sports. Is watching sports wrong? No! Is watching sports and ignoring your family okay? No. Is it okay to miss a game or two? Probably not for some. Could they incorporate their children into watching the sports, make it a family event? Maybe. Now to Mrs. Sweney, she was a runner. She ran every morning for a couple hours, and she was involved in the activities she was interested in. I can give her some slack here, as this was all she did. She took care of the kids, she cooked, cleaned, and even did the yard work. She was the responsible parent. I don’t mean to knock on the husband of this family, but he really needed to step up and do something. Although Mrs. Sweney did everything, she wasn’t an affectionate mother, and she lacked consistency and expectations. But then, I don’t blame her so much when I think of all she was carrying, her husband acted like one of her children. The Sweney’s decided to send Adia to a group home because she wasn’t bonding. Wonder why. The day they were to drop her off, mom drove her, and Dad had something “more important to do.” At the end of Adia’s stay, Mom and Dad were invited to join her for a week. While there, Dad went hunting. The last thing Dad needed was time away. Sending Adia off wasn’t what they needed to do. They needed to make their family a priority, especially their adopted daughter. Mom and Dad need to be a team and invest in their child. Their time needed to be spent together. 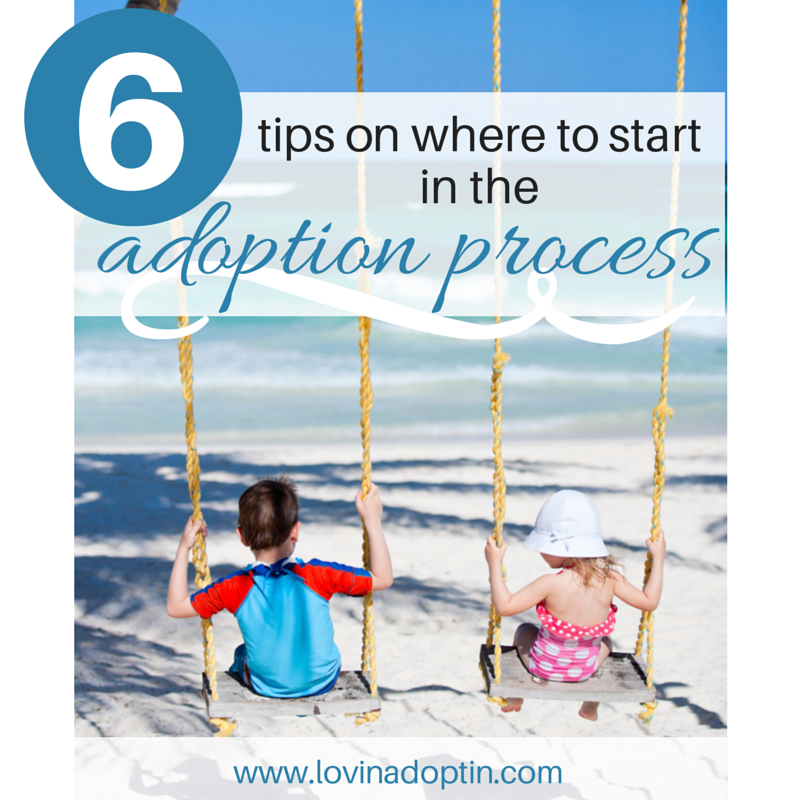 There’s a period of time after adopting or after a foster child joins your family when families need to put complete focus on that child. It requires parents to put aside their hobbies and interests and converge on what the traumatized child needs. 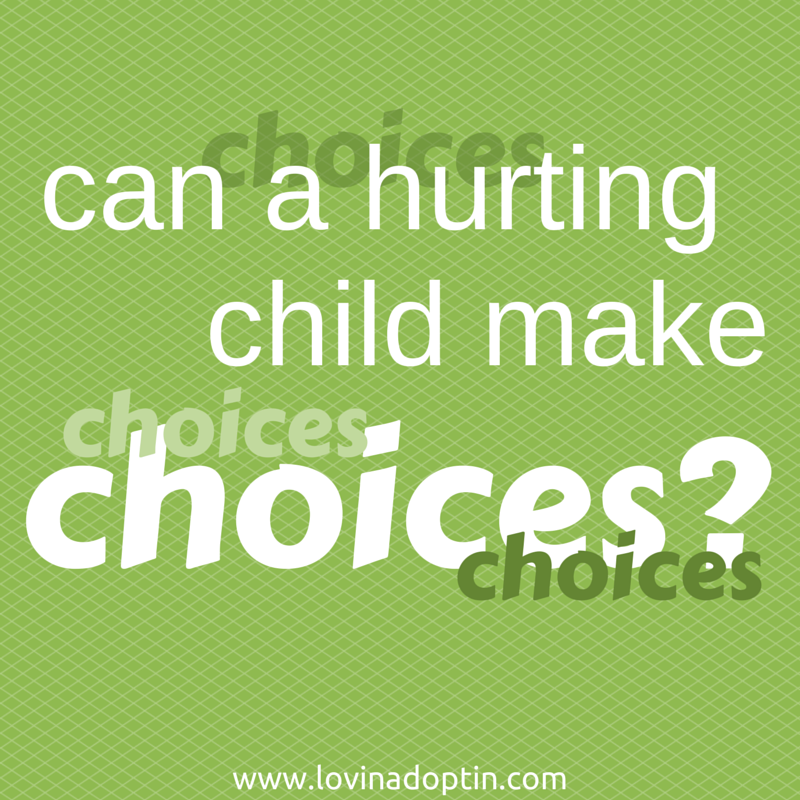 It’s not easy, but it’s so rewarding when you see what pain a child’s been through and the light on the other side. I can’t tell you the joy I’ve felt when my daughter healed and wanted to dress like me, wear jewelry that looked like mine, wanted ME to walk her to class, while she held her head high, proud of ME, her mom. Or when she wants me to hug her and hold her when she’s sad, when she’s upset at me but can turn it around quickly and talk about what’s going on. The joy when she wants me to volunteer in her class and doesn’t yell that she wants me to go away. Joy, pure joy, but it takes work to get there. You can also see an article I wrote about how our children were tore down quickly, but it takes time to build them back up. *Sports isn’t the addiction for everyone, I encourage you to look at your life and see what might be taking the focus away from your kids. Is it yard work, cooking, pinterest, volunteering outside the home, work? *I’m not saying anything the Sweney family did was wrong on its own, but when it’s combined it can be detrimental to the family, especially to the traumatized child.